On 2016/07/20, we moved to a new server solution that should have cleared any timeout issues, both for license activation and PayPal transactions. Of course if you are still experiencing problems you can still follow the instructions below, but most issues (especially with GoDaddy servers) should be a nightmare of the past. 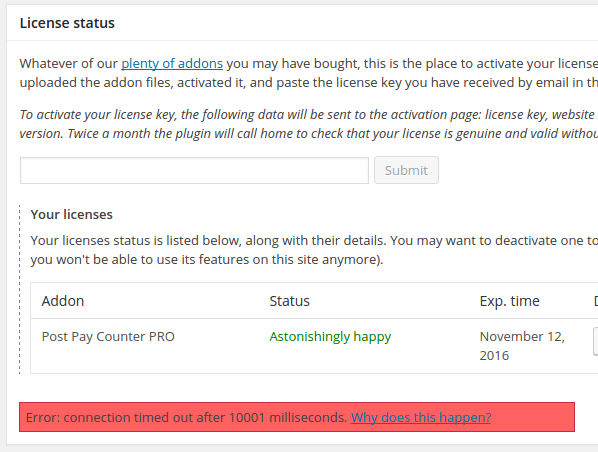 People who had their license manually activated may experience issues (especially with PayPal) because their license does not seem active for the license server. This can be easily fixed by deactivating your license and reactivating it. It may sometimes happen that license requests (activation/deactivation) fail with a connect() timed out! error. This is usually due to server problems, either of your server or of our own. Letting a couple of hours pass and trying again can be a good idea, to start. If you are sure that outbound connections to arbitrary hosts are allowed from your server (and please, don’t take it for granted, check it out! ), then it is likely that your server IP falls in our host firewall filters. This is often the case for domains hosted on GoDaddy. Since those filters are not managed by us, there’s no way for us to to white-list your IP. One thing that could solve is to reboot your server so that a new IP address will be assigned to it. If above advice fails, we do provide manual license activation, so that addons features can be unlocked and you can fully use paid plugins. However, please notice that features that require remote requests to our server (such as Facebook authorization, or PayPal payments) may not work, even if we manually activate the license. However, this issue is often temporary: it may happens that after some time (couple days, couple weeks) requests get through eventually, so that all plugin features can be used. Your IP could be blocked for a short time frame and then removed.